Who doesn't like candy? 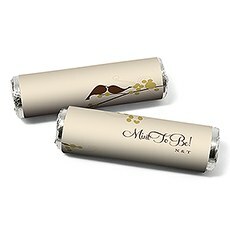 Our personalised candy wrapper favours - and their luscious contents - are guaranteed to please! Each wrapper is designed to fit a 22-gram roll of candy, which is not included. Purchase these candy wrapper favours as a stunning detail to our available gourmet chocolate candy bars - all that it takes is a little elbow grease and your candy will be transformed into lovely favours that your guests will go gaga over!Choose from several different designs - each design features pretty patterns, fabulous fonts and brilliant colours that will enhance any tabletop decor. From traditional and romantic to contemporary or simply classic, you will find the personalised candy wrapper favours that you are looking for!Each design is available in a multitude of colours. Choose your favourite colour or the colour that best matches your wedding or reception theme. Personalising these gorgeous candy wrappers is easy - just use our customisation tools and see how your personalised candy wrappers will look. There are no surprises here!For a traditional style, choose the Love Bird Damask design. The lovely colour details are changeable, and the floral and bird damask decoration is classically beautiful in its stunning black and white pattern. 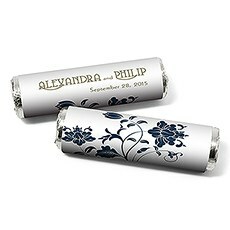 For a floral pattern, opt for our Floral Orchestra candy roll wrap - choose your flower colours. These lovely flowers feature a stunning colourful pattern that is sure to enhance any table setting or wedding decor. Fans of heart shapes will love our Contemporary Heart or our Heart Strings wrappers - capture the romance and the whimsy of your wedding day with playful hearts. 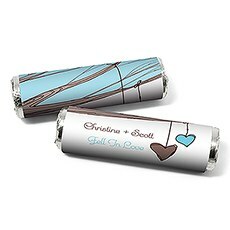 An invitation to a lively party awaits your guests with our Expressions candy roll wrap. 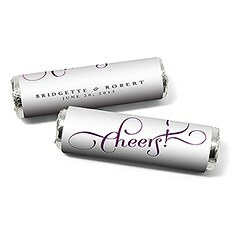 Choose from "Cheers" or "Enjoy", and then choose your colour pattern and design to personalise these candy wrappers to match your decor.Our candy wrappers are a sweet way to incorporate mouth-watering candy treats into your celebration.